Great news for all Swedish and Scandinavian SilverFast users. Moderskeppet.se has just released a very comprehensive online scanning tutorial. Photo and image processing expert Gustaf Hellsing has prepared a 3,5 hour video course introducing all the basics and revealing many advanced tricks on using SilverFast 8 to receive brilliant images from scanning all kinds of originals. Gustaf shows how to properly install and setup SilverFast and he gives some theoretical background on scanner resolution, Dynamic Range and other elemental terms. The main part of the video course introduces in detail the different scanning techniques and SilverFast features needed to successfully digitize black-and-white photos, colored pictures, negatives and slides. 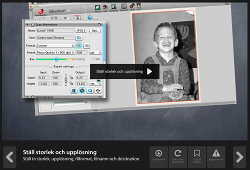 Click here to visit Moderskeppet's SilverFast Video Course. To get a general idea, a few movie clips are free and do not require any registration. Moderskeppet: « Scanning the family's old photo treasure can really tax someone‘s patience. Therefore it would be nice to do everything correctly the first time without risking of having to re-scan everything. ©2014 LaserSoft Imaging®, prices, specifications and images are subject to change without notice. Prices are in Euro.